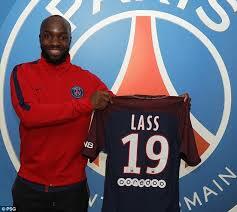 French outfit, PSG have completed the signing of French international, Lassana Diarra on a one-and-a- half year deal. Les Parisiens are in a defensive midfield conundrum as Thiago Motta is currently injured. Manager, Unai Emery has used 21-year- old Argentine midfielder, Giovanni Lo Celso in the anchorman role, but the youngster is struggling to impose himself on the position. Diarra completed his return to the Ligue 1 by signing for Paris St Germain on Tuesday. Diarra is a vastly experienced player who has played for the likes of Chelsea, Arsenal and Real Madrid with his best spell coming in the Spanish capital. Diarra has been available on a free transfer ever since leaving Al Jazira in December. Diarra expressed his delight at signing for Les Rouge et Blues, telling the club’s official website,;I am very happy to have signed for my hometown club, Paris Saint-Germain represents a lot to me and, with the international dimension the club has taken in recent seasons, it is every players dream to play here. I am lucky enough to make this dream come true, to know what it feels like to play at the Parc des Princes wearing the Rouge et Bleu. I intend to do everything I can, bring all my experience and show all my desire to play, to prove that the club has made the right choice in showing its confidence in me.&quot; He added. Diarra, who last featured for France in 2016, could make his PSG debut against Guingamp on Wednesday in the Coupe de France. Diarra is a defensive midfielder known for his intelligence on the ball, ability to stop opposition forays and willingness to launch the ball to forward players in brilliant counter-attacking moves. He is also known to the role model of Chelsea midfielder, N’Golo Kante which speaks volumes about his ability.